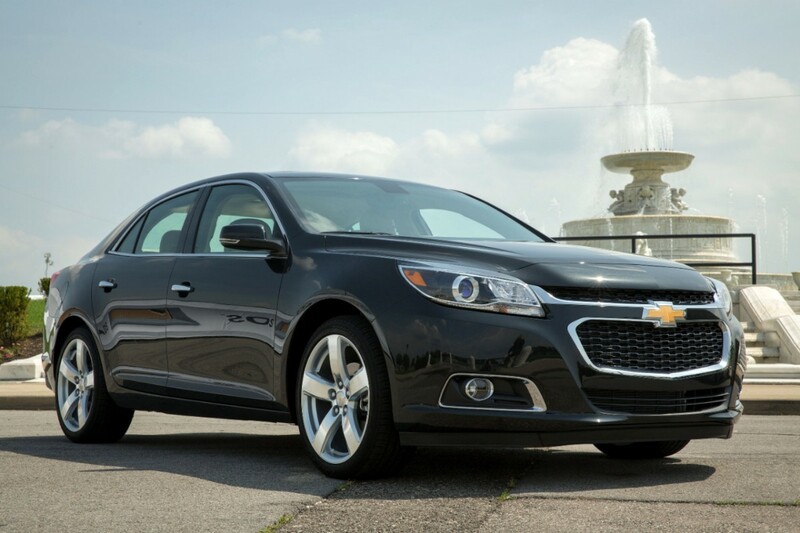 Chevrolet has updated its global midsize sedan for the 2014 model year to include all-around improvements, most notably in fuel economy, power, and rear-seat legroom. The updates were announced roughly one year after the launch of the completely re-engineered and re-designed 2013 Malibu. Even though the Malibu was completely overhauled for the 2013 model year, Chevrolet followed up the all-new model with a refreshed model. While not officially announced or confirmed by GM, it’s believed that the biggest reason for the hurried refresh is the lukewarm reception by the automotive media, and subsequently, by the market at large. Through May, U.S. sales of the Malibu were down over 36 percent in 2013. In addition, stalwarts such as the Toyota Camry and Honda Accord, along with the recent market success and strength of new contenders from Ford (Fusion), Hyundai (Sonata), Kia (Optima), Mazda (6), and Volkswagen (Passat/NMS), General Motors couldn’t afford to sit still and watch its market share be eroded in one of the most competitive and vital segments. So the automaker took intentional and calculated action to right its course, and briskly issued updates to the Malibu. The comprehensive message is that the vehicle has been improved and re-calibrated across the board, with updated styling, a roomier and more refined interior, revised powertrains, and suspension enhancements. 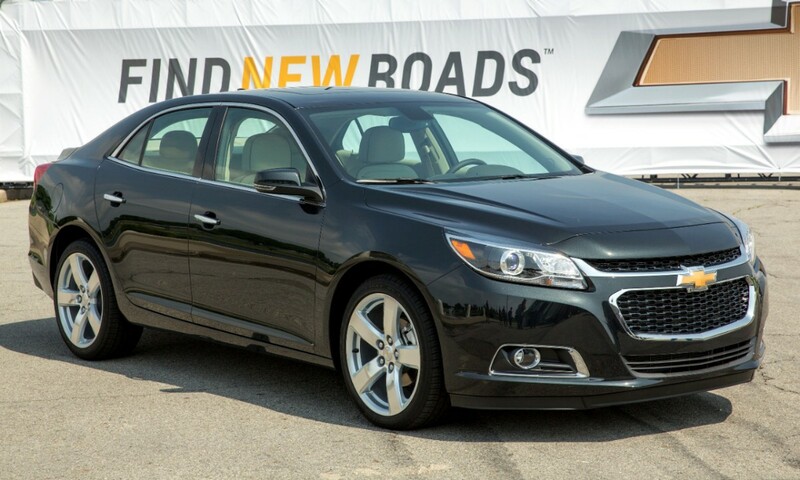 The most noticeable difference for the 2014 Chevy Malibu is the exterior design, which has received a noteworthy update. 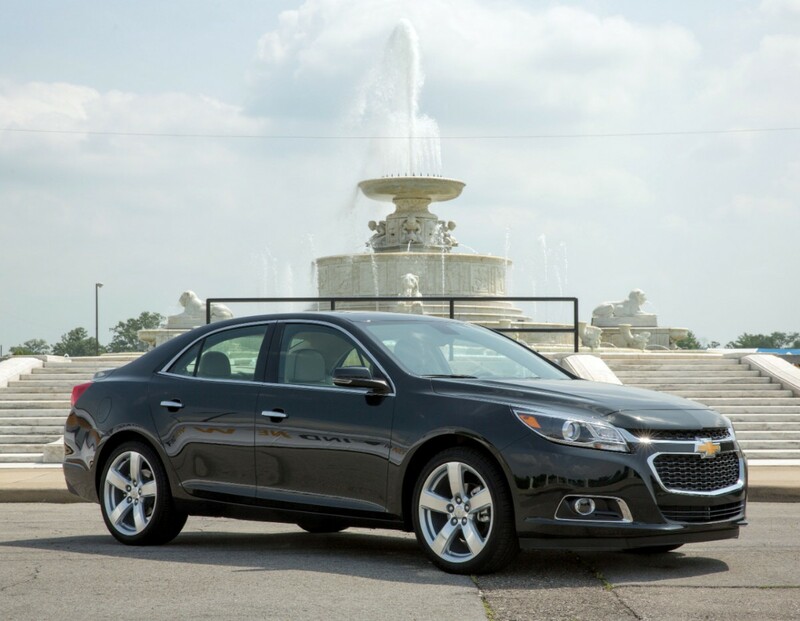 Chevy says that the front-end design is influenced by the all-new 2014 Impala, thereby creating a more cohesive look across Chevrolet’s sedan lineup. The front-end design changes feature a new and more prominent lower grill, a hood that extends down and over the leading edge of a narrow upper grille, while the grille openings (with black a black grille texture) are wider and accented with chrome. 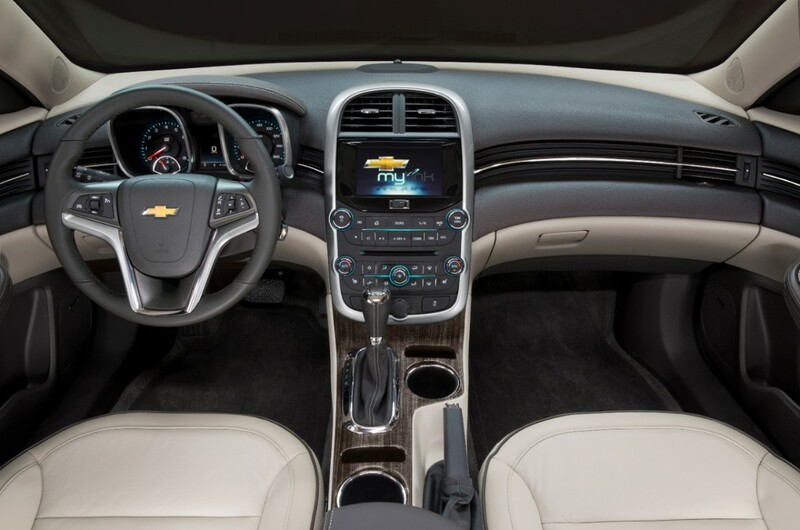 First and foremost: yes, the 2014 Malibu’s cabin features redesigned seats that result in greater rear-seat space and greater comfort — thereby addressing what has possibly been the biggest complaint of the 2013 model. The front seatbacks are shaped to improve rear-seat knee room, while the rear seat cushions feature new sculpting and revised cushion material to allow passengers to sit deeper in the seats. Designers trimmed roughly half an inch from the front of the rear seat cushion to increase comfort behind passengers’ legs. 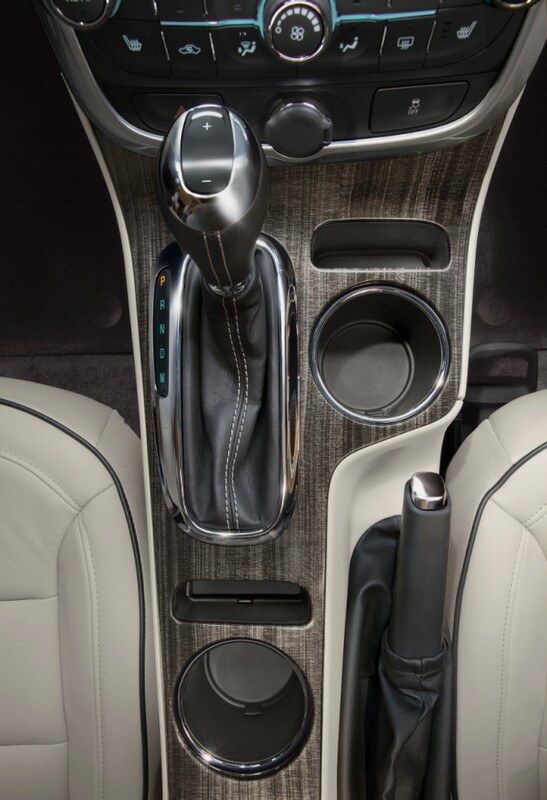 Outside of the changes to the seats, the 2014 Malibu features a redesigned center console with a longer armrest for greater comfort. There’s also a pair of cup holders and dedicated storage for two cell phones. The 2014 Malibu has a new base engine in the all-new four-cylinder Ecotec 2.5L DOHC with direct injection and Intake Valve Lift Control. The four-banger’s variable intake valve actuation enhances efficiency and helps lower emissions, while also enhancing low-rpm torque for a greater feeling of power at lower speeds. When the iVLC system operates in low-lift mode, the engine pumps only the air it needs to meet the driver’s demand. The system switches to high-lift mode at higher speeds or under heavy loads, providing the full output capability of the engine. In addition, the 2.5L has start/stop technology that shuts down the engine to save fuel when the vehicle stops momentarily (such as at stoplights), contributing to an estimated 5-percent increase in city fuel economy. The engine automatically starts again when the driver takes his or her foot off the brake. An auxiliary battery powers electric accessories such as the climate system, power windows and radio during engine restarts. The new 2.5L is SAE-certified at 196 horsepower (145 kW) and 186 lb-ft of torque (253 Nm). Revised transmission shift points and quicker shifts also enhance the feeling of performance while delivering greater refinement. The 2014 Malibu’s optional 2.0L Ecotec turbocharged engine (production code LTG) continues to make 259 horsepower (193 kW), but it now delivers nearly 14 percent more torque than its predecessor — an SAE-certified at 295 lb-ft (400 Nm). The increase is the result of new engine calibration and tuning, making the Malibu 2.0L turbo’s torque the best in the segment. 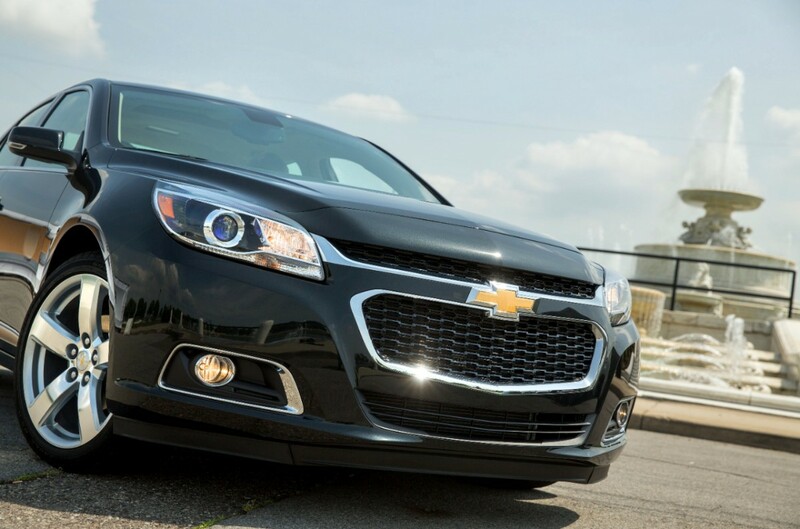 In fact, the 2.0L turbo in the 2014 Malibu delivers more torque than competing six-cylinder-engines, resulting in a stronger feeling of acceleration from a stop and a greater feeling of power on demand in almost all driving conditions. The 2014 Malibu features chassis and suspension updates inspired by the all-new 2014 Impala, contributing to a more refined driving experience. Possibly the most notable update to the refreshed Malibu’s suspension are rebound springs that are internal to the struts, enabling more refined calibration of the dampers for a smoother overall ride while improving body roll control and weight transfer during acceleration or turning. This helps keep the wheels planted, contributing to a more precise, controlled feel — especially while cornering. In addition, electric power rack-and-pinion variable-effort power steering is standard and not only saves fuel, but enables nearly effortless low-speed maneuvers and a higher degree of steering feel at higher speeds. 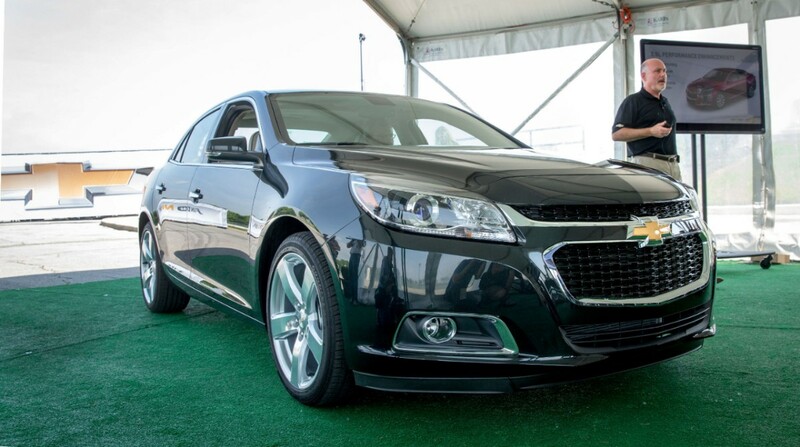 Engineers revised higher-effort calibrations of the 2014 Malibu to improve the overall steering feel. Meanwhile, the brake system has been re-calibrated to make for a more confident feel. The 2014 Malibu offers new Side Blind Zone Alert and Rear Cross Traffic Alert safety features, adding to the vehicle’s 10 standard air bags and already-strong 5-Star Overall Vehicle Score in the New Car Assessment Program from the National Highway Traffic Safety Administration and a 2013 Top Safety Pick by the Insurance Institute for Highway Safety, both of which are the highest ratings possible. The 2014 Malibu goes on sale in the fall of 2013. 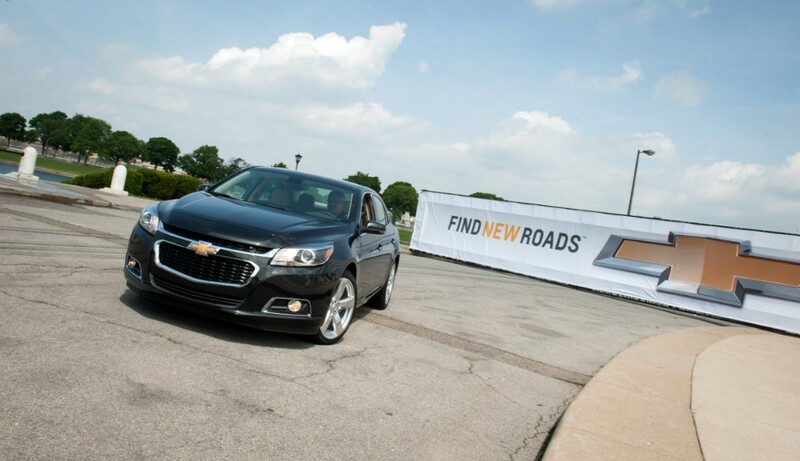 The 2014 Malibu was revealed at a special media event on Friday May 31, 2013 at the Detroit Belle Isle — one day ahead of the 2013 Belle Isle Grand Prix. Watch a video from the reveal featuring GM North America President Mark Reuss. Editor’s note: this section was written months before the official announcement by Chevrolet. As such, it contains various predictions that are inaccurate. We’re keeping it around here in an effort to preserve any historic value that might exist herein. 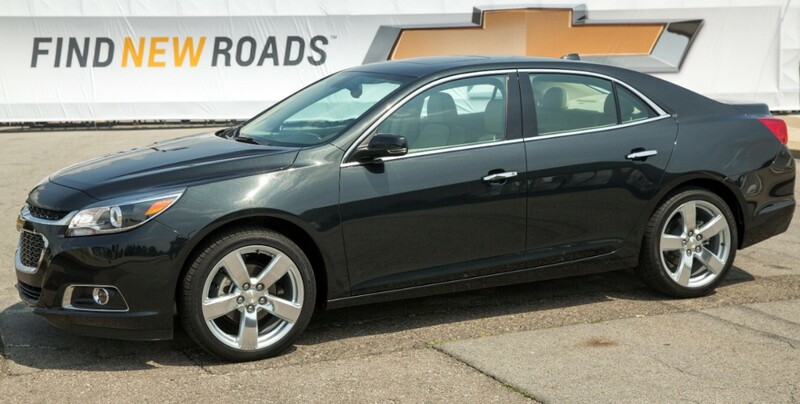 A refreshed Chevrolet Malibu is being fast-tracked to market for the 2014 model year. The main purpose of the update, which will come only a year after the all-new eighth-generation 2013 Malibu went on sale, is to address the major criticisms of the vehicle. Possibly the biggest complaint about the all-new 2013 Malibu is the amount of rear seat legroom, which is smaller than that found in the car’s competitors. Since engineers are limited in what they can do with the car from a technological perspective (the wheelbase can’t be stretched, for instance), Chevrolet plans to address the complaints (whether founded or not) by using creative methods, such as increasing the depth of the cutouts on the backs of the two front seats. 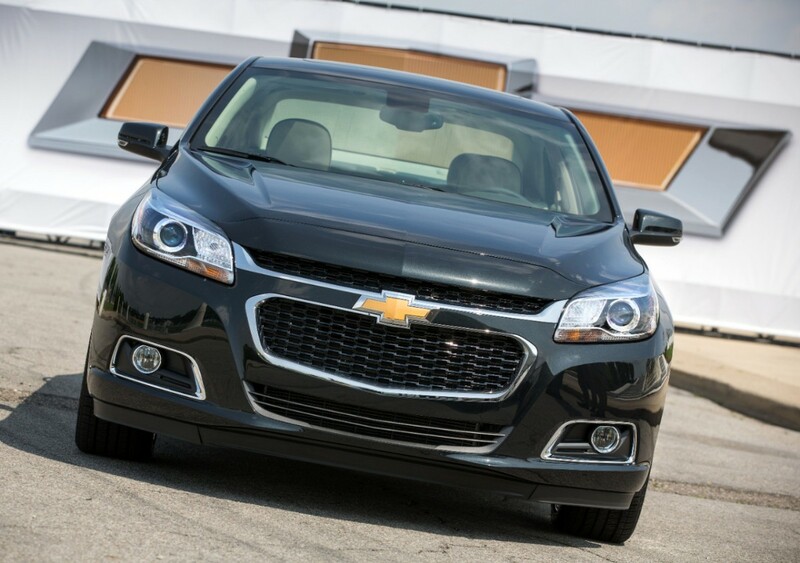 Front fascia: the design of the front end of the 2014 Malibu will match that of the 2014 Chevrolet Impala, which itself is based on the stretched variant of the Malibu’s Epsilon II vehicle architecture. Powertrain: some sources say that the 2014 ‘Bu will include new engines, even though the 2013 model already has the all-new 2.5 liter and 2.0 liter turbo four-cylinder Ecotec engines. It is, however, possible that GM all-new 1.6 liter turbo Ecotec will make its way into the 2014 Malibu so as to compete with the 1.6 liter EcoBoost offering found in the new Fusion. To note, the 2013 China-market Malibu already offers a 1.6 liter turbo engine, but it’s part of the last-gen Ecotec family, while the Malibu in the Middle East offers the 3.0 liter V6 LFW. Equipment: the 2014 Malibu will also introduce changes in the equipment- and trim-level configurations. Other small tweaks: GM Authority has received intel about possible improvements to the Malibu as it relates to small, incremental improvements to the vehicle’s cabin, although — as of this writing — we have no details as to what those might be. The midsize sedan segment is of significant importance to mainstream brands such as Chevrolet. For nearly a decade, the segment has been dominated by the Toyota Camry and Honda Accord, with the former even taking the crown of the best-selling car in America. As such, Chevrolet needs to bolster its sales volume and public reception of the Malibu in order to maintain financial health and solid reputation. In addition, the midsize sedan segment has become extremely competitive over the last two years, with all-new entrants such as the Volkswagen Passat, Ford Fusion, Hyundai Sonata, Kia Optima, Nissan Altima, Mazda6, and the redesigned versions of the Camry and Accord segment stalwarts. Traditionally, the Malibu has sold roughly half of what the Toyota Camry does in a given year. The 2014 Malibu is expected to be announced in either Q3 or Q4 of 2013, launching worldwide in the first or second quarter of 2014. Reports of pre-production models have surfaced in 2013 at GM’s Detroit-Hamtramck plant.